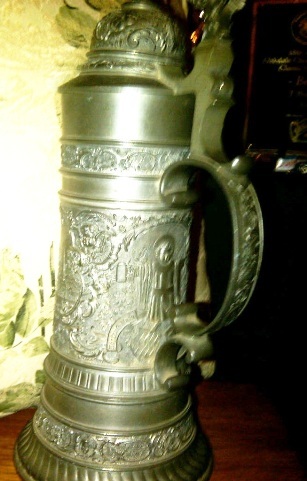 One of the benefits of having a web site such has mine is that one gets some very different e-mails about old beer steins, of course most often they are questions. 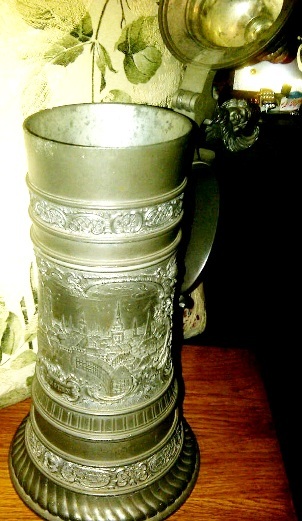 I am attaching a couple pictures of a old stein that I found 60 years ago. I would love to know something about it. 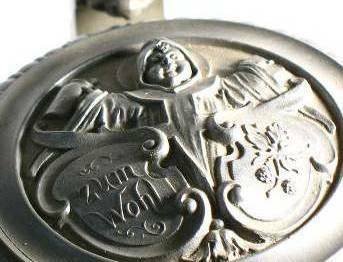 It looks like it could have been made by J. Lichtinger, Munich by the looks of the handle and angel with wings on the thumblift. I am not trying to sell it. I just would like to know its history. Thank you! Ken Klein, Oakdale, Ca. Hello Ken, and thanks for the email,  I am trying to keep track of the “Goggle key words” people use to find me, so what was yours please?”  Definitely Lichtinger’s work ! 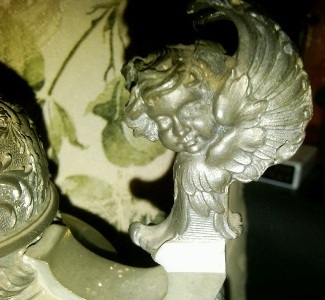 Please see the attached photo = Is this the front scene in relief on your stein also? Your photos were a bit indistinct. If so, as one can see on the photo “title” it was made and sold about 1904. It also came with at least one other type lid with the Munich Maid on it. 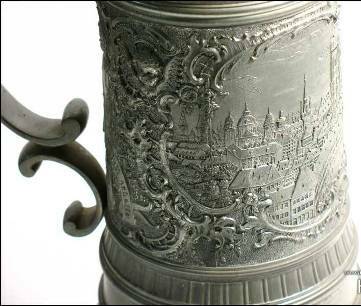 These were very popular “take home souvenirs” from the City of Munich, Kingdom (at that time) of Bavaria. Thank you so much for the info you provided. Yes that is the front scene of the stein. It is definitely a picture of the Frauenkirche. That church was finished in 1468. The domes were blown off during WWII and later replaced. Hi Ken, I was there in “The Fatherland” for two years (in the 60’s, bringing in missile control) and I too was more interested in what was inside them; but even more importantly who was pouring the beer in them. I had one great [but short] relationship with a German bar-maid. Then went onto the German housekeepers – they were much more…. shall we say….”safe”? RE: Hope we can communicate again. I think that whole story is neat! Why not do me (and your heirs?) a small favor and jot down a few paragraphs about your thoughts about finding that stein? Think it was was it a hobos, who left it behind? Stolen? Fell out of a caboose, or from a track inspectors wagon ? etc.? And then what you did with it? And perhaps memorable times in the past perhaps that you have used it, etc. I almost fell off my chair when you mentioned the hobo’s and things falling off of a caboose. I’ll explain. 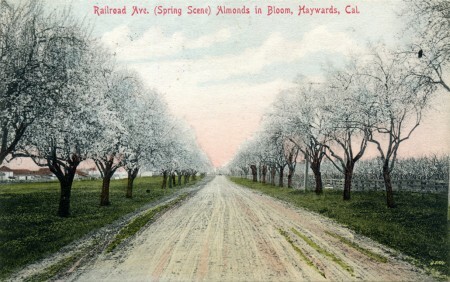 When I was a child our orchard ran right op to the Southern Pacific railroad tracks. That whole area was my play yard. I still have a large cooking pot with clamp down lid that fell off of a caboose. And we always had hobo’s come up the orchard to our back porch and ask for used coffee grinds. My Mother would always make them a sandwich and have them sit on the porch and eat it. She would always give the a religious tract to read. They were always nice people, just a little down on there luck. But I (think) that my stein did not fall off a caboose or belong to a hobo. [In a later email: Now about being sure that the stein didn’t fall out of a caboose, I’m not!! There could be other ways it got there. One of them is that in the 40’s a lot of troop trains passed by our place. Maybe some GI returning from Europe had a problem with Germany. Hayward, Ca. also played a big role in the war. As a small child I remember a rare tank convoy come down our street, which was then dirt…………………………. ………..P-38’s: Mustangs, and Belair Cobra’s were not uncommon flying over our house. Also, near the airport was a large war surplus scrap pile which I think my two older brothers tried to carry home. All that is gone now, including our home and orchard. The cannery’ and pickle works are all gone. Where our place was is now a industrial park. Well one of these times I rolled over and felt something under me which was my beer stein. Front, left side detail again. Well when I walked back to the house, probably with the stein full of “Polliwogs” my sister was there and saw the stein. She was already married and she asked to take it home to her house. 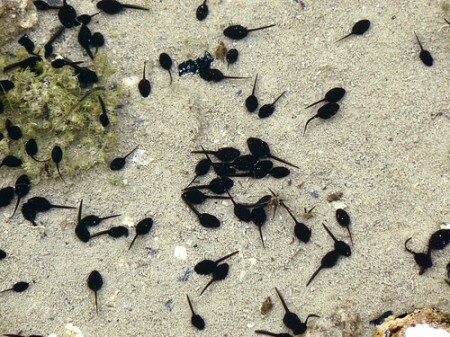 I thought that it was alright because I didn’t see any use for it other than catching tadpoles. Photo provided by the editor for those younger stein collectors (or 100% city boys) who might not know what “Polliwogs” look like. That was about sixty years ago. I would occasionally see it on there fireplace hearth but thought nothing of it. Now my sister is very elderly and has had to move in with one of her Grand-children. So her son was getting rid of all her old things and I brought up to him my story of finding the stein and letting her have it. He remembered the stein growing up and said he would look for it. last month at a birthday party for my aging sister he brought out the stein and said that I should have it. So that’s why it took all these years for me to start checking on the history of it. Some day I will give it to my daughter Kelly and with her husband live in Livermore,CA, just about a hour away from us. 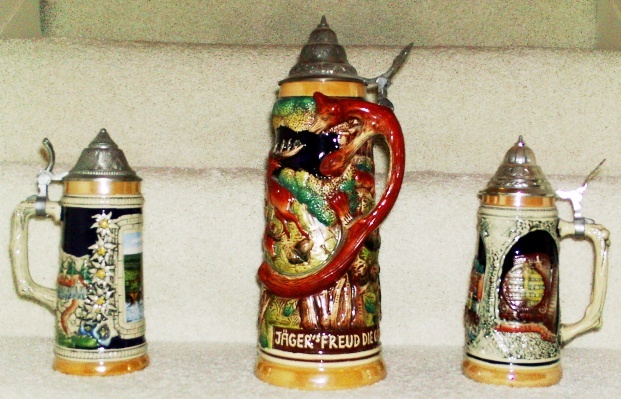 I have three more steins that my son had given to me. He was married to a girl from Germany. But sad to say he passed away eight years ago and is so missed. I clicked on that and by golly there was my angel. Thank you for that. I do enjoy German beer steins but I am more into Hot Rods. 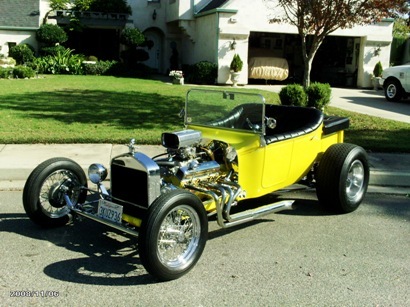 I have built up a 1923 T bucket. And I enter it into car shows. I’ve attached a few pictures below. And again thank you for solving the history of my beer stein. 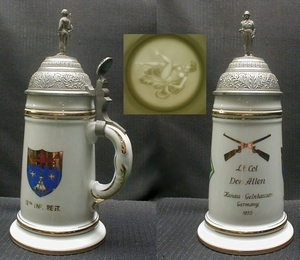 *** Below: Photo of a GI or Cold War Stein photo. This one is non-MP, and dated 1955. Ken was in Germany in 1957. The TV evening news is where they begin with ‘Good Evening,’ and then proceed to tell you why it isn’t!